Dhaulagiri 8,167m - the 7th highest mountain in the world - means the "white mountain" though many mountains over the world have names, which translate to White Mountain. This is a strenuous trek, through high alpine pastures, higher passes and serene and uninhabited valleys. 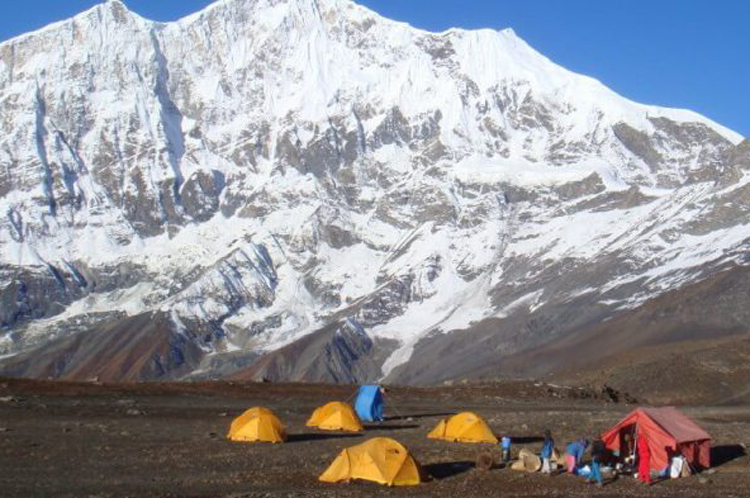 Everyone is familiar with the name Dhaulagiri which is in the western part of Nepal, probably the best spot for remote and adventurous trekking in Nepal. The simple reason behind it is that it consists of more than fifteen 7,000m magnificent peaks with land of dramatic contrast. 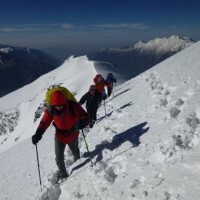 Dhaulagiri trekking routes start after an 8-hour scenic drive from Kathmandi to Beni, from Beni you head in a north-westerly direction through the villages of Babichour, Dorbang and Darapani to Muri, from where you head north still keeping to the banks of the Myagdi Khola. Muri is the last major settlement along this trail and is inhabited by people of the Magar tribe, of Mongoloid stock and descended from the early settlers of the Nepalese middle hills. From Muri, you head north along the Myagdi Khola through the villages of Baghara, Dobang and Chartare to Pakoban. Beyond Pakoban there are no permanent settlements. 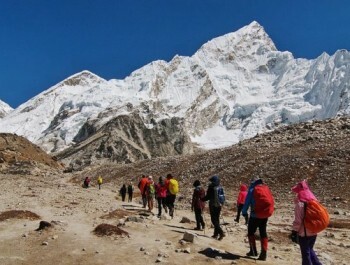 Still heading north you skirt the Chhanbardan Glacier, keeping on its left side, to reach the Dhaulagiri Base Camp from where magnificent mountain vistas are available. 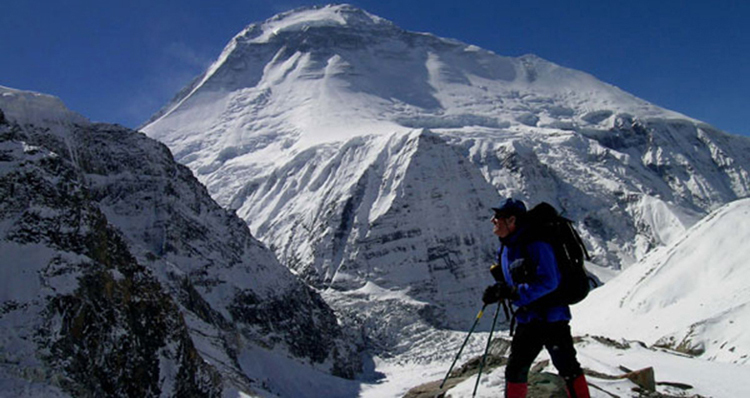 Head north-east from the Base Camp and climb the steep incline to the French Pass (5,360m), between Tukche Peak (6,920m) and Sita Chuchura (6,611m). Heading east you descend a little and pass through a portion of the Hidden Valley and climb to Thapa Pass (5,250m), between Tukche Peak and Thapa Peak (6,012m) from where you begin your descent, heading south-east to Alubari. From Alubari, the trail further descends to the village of Marpha on the banks of the Kali Gandaki River, and then heads north to Jomsom from where you fly back to Pokhara. Our airport representative will be receiving you at Tribhuvan International airport, Kathmandu and s/he will be displaying an Nepal New Generation Trek and Adventure signboard outside the airport terminal. You will be then transffered to your respective hotel in our private tourist vehicle. Overnight at Hotel. After breakfast, you head to Beni by Local Bus. You'll find most of the scenery is very enjoyable along the countryside. Beni is the district headquarters and has a police check post where your trekking permits will be examined. 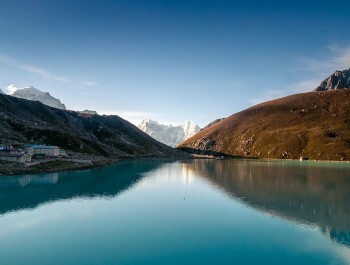 The town is at the confluence of the Myagdi Khola and the Kali Gandaki. Overnight at tented camps. Leaving Beni and Kali Gandaki the trek heads west along the north bank of the Myagdi Khola through the village of Beni Mangalghat to Singa and Tatopani (hot springs). Crossing the bridge beyond the village to the south bank of the river, the trail makes a little half loop before crossing another bridge, near the village of Simalchour, back to the north bank from where it continues to the village of Babichor. Overnight at tented camps. The valley widens and terraced hills develop on both sides of the river. The trail is fairly level and you pass the village of Shahashradhara, cross the Duk Khola and walk through fields arriving at Ratorunga. From here the valley narrows again and terraces disappear on either side of the river. Continue to the village of Dharapani. Overnight at tented camps. After crossing the river to its West Bank as you leave Phedi, the trail starts climbing in earnest and there will be many switch-backs until you arrive at the ridge and the angle of ascent eases. Again the trail climbs steeply to the villages of Muri. Continue your trek to Sibang and Mattim. From here you continue up an incline to the snout of the ridge, descend to the Gatti Khola and reach Phalai Gaon (1,810m). Cross the Dhara Khola to once again emerge on the west bank of the Myagdi Khola and then climb a ridge to the large Magar village of Muri. Overnight at tented camps. Descend a little, cross a stream and continue through terraced fields before climbing a ridge to reach the pass from where you can see Mt. Ghustung South (6,465m). Descend to the Myagdi Khola and trek along its West Bank to the village of Naura from where you will climb a little before traversing a grassy hill and climbing a steep slope with switch-backs, then descend through a forest and terraced fields to Boghara (2,080m). Overnight at tented camps. The trail first descends through terraced fields to a small ridge, then through a forest to Jyardan which is the most remote permanent settlement in this part. After the settlement a high winding path crosses a rocky area which then descends before climbing again to Lipshe where there is one single hut. The trail continues through a forest to Lapche Kharka and then climbs to the level area at Dobang. Overnight at tented camps. After crossing a wooden bridge out of Dobang the trail ascends a forested area. Soon the west face of Dhaulagiri I (8,167m) becomes visible through breaks in the trees. 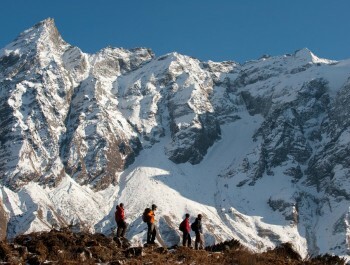 Descend to the Myagdi Khola and cross via a wooden bridge to the east bank continue to Chartare. Passing through forests again, you cut across a rocky area and cross a stream to Choriban Khola. Overnight at tented camps. 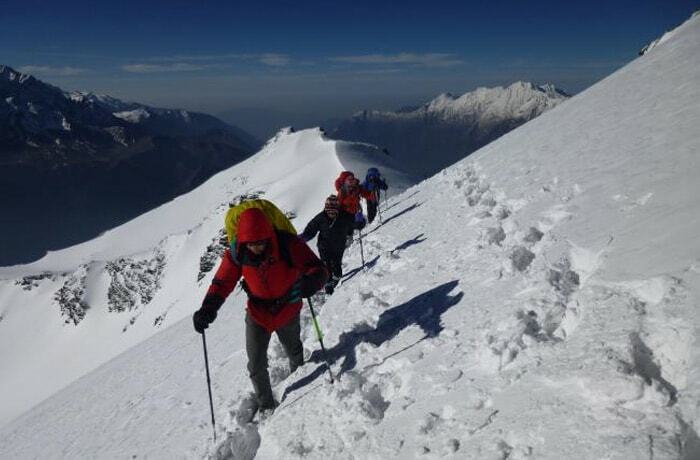 Follow a trail to the terminal moraine of the Chhonbarban Glacier and enter the glacier from the right. Tukche Peak (6,837m) becomes visible straight ahead; at the far end while the impressive north flank of Dhaulagiri I (8,167m) dominates the skyline to your right. 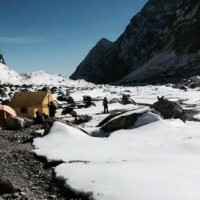 After a short while you will reach Italian Base Camp (3,660m), which is also the site of your camp for the night. 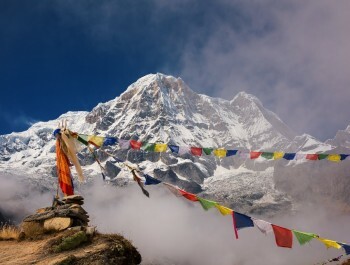 To the west are the peaks of Dhaulagiri II (7,751m), Dhaulagiri III (7,715m) and Dhaulagiri V (7,618m). Overnight at tented camps. We will spend a day acclimatizing to the thinning of the air. It is recommended that your body acclimatizes to the high altitude and be adjusted for higher altitudes in the days to follow. Overnight at tented camps. Set up early in the morning when the weather is expected to be clear. This Trail is prone to stone fall, which passes through a narrow gorge. Today we stay overnight near at glacier. Overnight at tented camps. 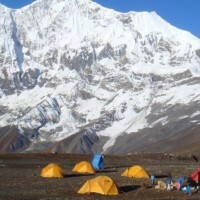 This is one of our adventurous days to Dhaulagiri base camp. From here you can look up at the impressive north face of Dhaulagiri I (8,167m) dominating the skyline to your right. 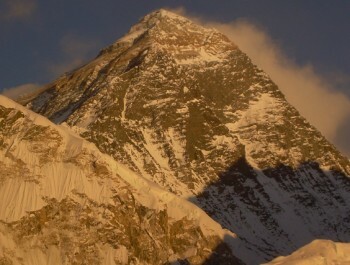 To the west are peaks of Dhaulagiri II (7,751m), Dhaulagiri III (7,715m) and Dhaulagiri V (7,618m). 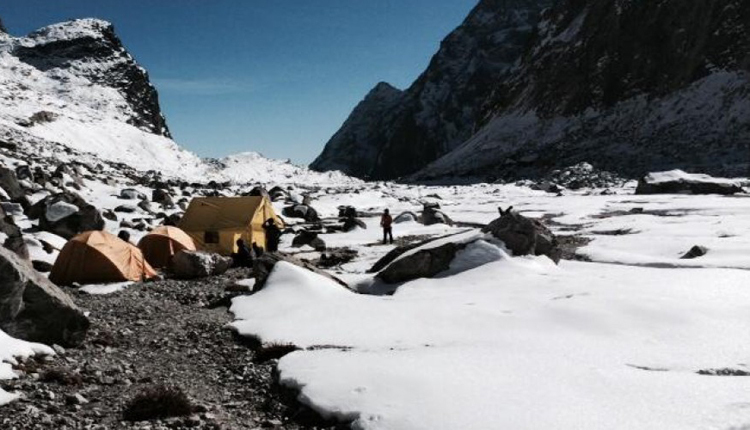 In front of you is the impressive icefall that descends from the north-east col. Overnight at tented camps. Another day to take some rest and more importantly, acclimatize to the lower air pressure. Views from this place are superb and there is plenty to explore. Overnight at tented camps. After the glacier you climb two terraced hills, the first of which runs along the glacier, then cuts across the mountain flank and the moraine you enter a gentle incline on the left from an ablation valley. 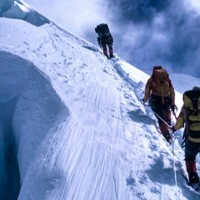 Climb this gentle slope to the French Pass (5,360m). A great vista opens up from the French Pass and you will be able to see Mukut Himal (6,328m), Tashi Kang (6,386m) and Sita Chuchura (6,611m), all of which surround the Hidden Valley. 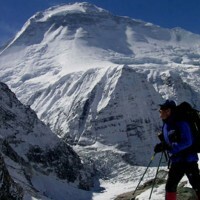 To the south is Tukche Peak (6,920m) and beyond is the massive peak of Dhaulagiri I. From the French Pass you continue along the right edge of the Hidden valley losing a little altitude to the Thapa Pass (5,250m) between Tukche Peak and Thapa Peak (6,012m). 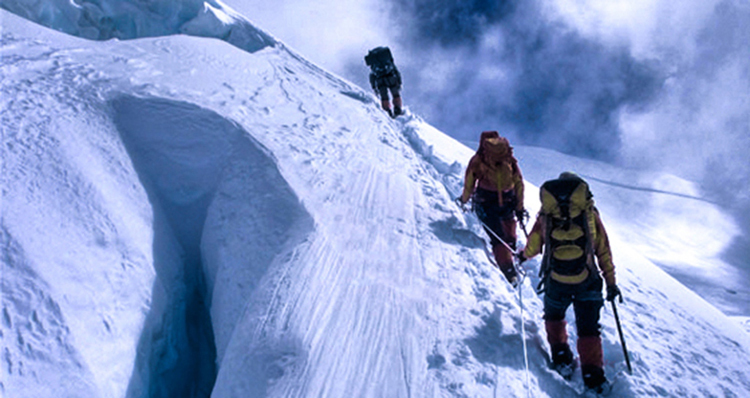 Descending from the Thapa Pass you will make it to the camp at 5,200m. Overnight at tented camps. 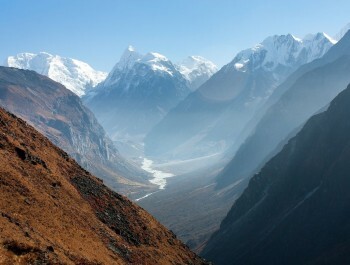 Descend from the Hidden Valley to the Dhampus Pass and continue to Yak Kharka. There is a perfect camp site to enjoy the surroundings. Overnight at tented camps. Continue on to the village of Marpha, on the west bank of the Kali Gandaki River. Marpha is home to many apple orchards as well as all various food products made from the fruit. Don't forget to taste the local Apple Brandy a specialty from the region that you may be lucky enough to taste en route. Continue north, up the river valley to the town of Jomsom. Overnight at tented camps. A 30-minute morning flight takes us to Pokhara from Jomsom. Once we arrive at Pokhara airport, we then drive to the hotel. In the afternoon we will have a sightseeing tour around Pokhara valley, which covers Fewa Lake, Devi’s water fall, Museum, Tibetan refugee settlement and Gupteshower cave, etc. Overnight at a hotel. It's also spare day in case of bad weather in Jomsom. Overnight at a hotel. You have the option to extend your trip to continue onto Chitwan jungle safari, rafting adventure, Kathmandu valley shopping tour, scenic Everest flight, mountain biking and other activities. In the evening we will have a farewell dinner in a traditional Nepalese restaurant with cultural performances. (Your guide(s) and an office staff will accompany you.) Overnight at a hotel in Kathmandu. Guided city tour in Kathmandu and Pokhara by private tourist vehicle. All your standard Meals Cooked by our expert camping cook and kitchen team during the trek (Breakfasts, Lunches and Dinners) . Down Jacket and sleeping bag by Ace the Himalaya (which need to be returned after the trek). Flight cost from Jomsom to Pokhara including airport departure taxes in Jomsom airport. Surface transfer from and to Kathmandu(Local bus transfer from Ktm to Beni and Tourist Bus transfer form Pokhara to Ktm). Free Ace the Himalaya duffel/kit bag, sun hat and T-shirt (yours to keep). Farewell dinner in typical Nepali Restaurant with cultural dance show on second last day (On Day 20th). Conditions stated in the itinerary are the visitors who prefer full package programme. At the same time, we also serve you based on your choice. The selection of itineraries and the staff depends on your choice and financial procurement. We have options for any partial visit as per your requirement regarding your interest and financial condition.